The Olverum Bath Oil Travel Set is the perfect way to pamper yourself on holiday. Wherever you are going this summer, you can take this luxurious bath oil away with you and still enjoy a relaxing, soothing soak in the bath, restoring both your body and mind. Olverum Bath Oil contains a 48% concentration of pure essential oils including Exotic Verbena, Siberian Fir Needle, Juniper, Rosemary, Lemon Peel, Lavender, Lavandin, Eucalyptus Lime and geranium. This wonderful combination creates a bath oil that will make you feel both very calm and relaxed. The Overum Bath Oil travel set contains 3 bottles of the much-loved bath oil. Each bottle is 15ml and the three bottles will allow you to have 9 luxurious baths. Whether you are on a relaxing weekend away, a tranquil trip to a beautiful destination or are on a fun-packed adventure holiday, you will be able to carry on your bathing ritual with this wonderful bath oil. This bath oil is also fantastic for soothing tired aching muscles after you have exercised. So if you are exercising in preparation for your holiday or you just simply like taking care of your body, this bath oil will help soothe your aches and pains. 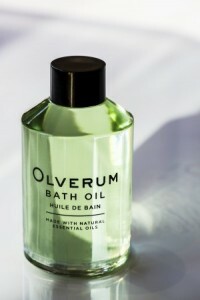 The RRP for the Olverum Bath Oil travel set is £16.00 and it is available from Liberty, Conran, Harvey Nichols and Fenwick.